The day after No. 99 was retired, Ray Bourque, No. 77, surpassed his fellow No. 77, Paul Coffey (at that point the defenseman with the most career goals), by scoring his 386th goal. In the first game of the season, held at Fleet Center (now TD Garden), Bourque’s second-period, power-play slap shot stood as the Boston Bruins’ only goal. Although they lost to the Carolina Hurricanes 1-3, the goal made Bourque the NHL’s highest-scoring defenseman. Two years later, Bourque retired with a career total of 410 goals and 1579 points (in 1612 games). He continues to hold the record as highest-scoring defenseman as well as having the most career points by a defenseman. 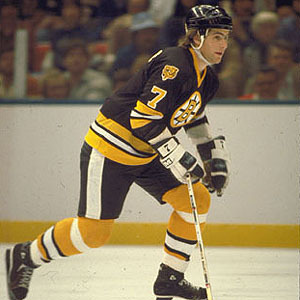 The Bruins drafted Bourque (as the eighth pick) in 1979, the same year that Gretzky joined the Oilers. Bourque would go on to play 21 seasons with Boston, requesting a trade during the 1999-2000 season in hopes of winning a Stanley Cup. He was traded to the Colorado Avalanche, who went on to win the Stanley Cup in 2001, with most hockey fans cheering for Bourque as they did it. Bourque won the Norris Trophy as best defenseman five times. He ranks fourth for repeat-winning defensemen. This is just one of the many awards and accolades he amassed. On October 4, 2001, the Bruins retired No. 77 before their season opener. As Bourque told ESPN at his last game in Boston, “I’ll always be a Bruin. I have a lot of memories here that can’t be taken away.” The Avalanche retired No. 77 that November before they played the Edmonton Oilers. Bourque had worn No. 7 for the Bruins until 1987, when Boston retired the number in honor of Phil Esposito. Like Gretzky, Bourque simply doubled his good fortune and made No. 77 hit the high-score jackpot.